Day Four (08.26.09) We were losing sunlight as we made the exit for Palm Springs. 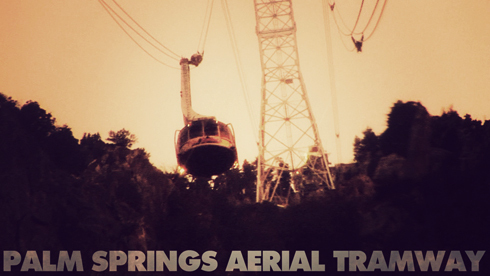 As you enter the city, a short distance after leaving the interstate, the first thing you notice is a giant Palm Springs Aerial Tramway sign. It seemed like the easiest thing to find, although after noticing there were no tram cars we realized (obviously) that we needed to head further up into the mountains. The incline of the drive didn't seem that bad at first, but you quickly realize just how far up you really are when you see the valley become more prominent behind you. As we pulled into the parking lot of the Valley Station of the Aerial Tramway it was clearly printed above the door of the building that we were already 2600ft. above sea level. Just walking up to the door of the building felt like a funhouse because of the steep and misleading incline. We bought our tickets and were quickly ushered into the loading area. It was soon after that that we found ourselves slowly rotating in one of the famous cable cars, surrounded by jagged rocks and steep embankments, heading from the floor of the Coachella valley up to the Mountain Station of the San Jacinto Peak (8500ft. above sea level). 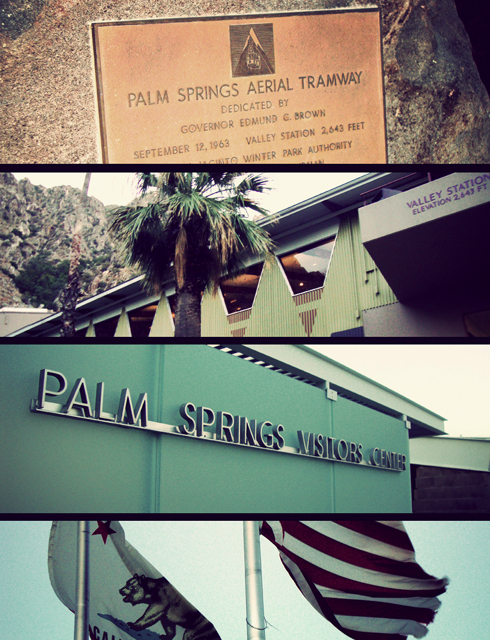 The Palm Springs Aerial Tramway seemed enticing just from what I'd read online before the trip, but to see it and experience it in person felt ethereal. It was so quiet, everyone seemed content to gaze and whisper to the person they were with. The light breeze from the open windows further reinforced a connection with the expansive and awe-inspiring views. It's difficult to explain, but easy to recognize, that the scale and beauty of something like this is challenging to process. I was very much in the moment. While the footage I shot is a great memento, something like this is meant to be witnessed - the visual reality suddenly makes you feel so small. The atmosphere, ambiance, and even the shift in temperature as our altitude rose, seem essential in completing my memory. It was so much more than just a pretty picture. By the time we reached the top and had something to eat it was dark. Patches of city light filled the valley, and from our perch we could see the lights trail all the way down to Indio. If our goal of taking an unforgettable road trip wasn't yet fulfilled, here we were quite literally on top of the world.